For this recipe you will need a medium, heavy-bottomed saucepan; a fine, conical strainer; a small (1-quart) saucepan; a large nonstick skillet; a set of tongs; and a whisk. 1. Peel and devein the shrimp, reserving the shells. 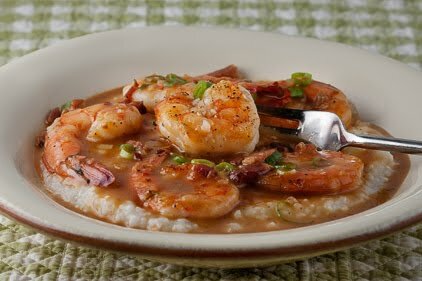 Dry the shrimp between layers of paper towels and refrigerate until ready to use. Heat the olive oil in a medium-sized, heavy-bottomed saucepan over medium heat. Add the shrimp shells, onion, celery, and garlic and sauté until the shells are crisp and the aromatics tender, 10 minutes. Add the water, tomato paste, thyme, bay, peppercorns, and lemon peel. Cover and bring to a simmer over medium heat. Reduce the heat and simmer, partially covered, until the stock is flavorful and reduced, about 1 hour. Strain the stock into a small saucepan (there should be about 1 1/2 cups), and keep hot. 2. While the stock is cooking, mash the butter and flour into a smooth paste in a small bowl and set aside. 3. Sauté the bacon or ham in a large, nonstick skillet over medium-low heat until crisp, 8 to 10 minutes. Move it to the periphery of the skillet and increase the heat to medium. Arrange the shrimp in a single layer and sear until pink. Sprinkle the shallots over the shrimp, toss, and cook until the shrimp is done, about one minute. Add salt, red pepper flakes, and black pepper. Using tongs, transfer the shrimp to a warm plate. Add the hot stock to the skillet and bring to a boil over high heat. Whisk in the reserved butter and flour mixture. Cook until thickened, about 20 seconds. Return the shrimp to the pan and taste sauce for seasoning. 4. To serve, spoon the hot grits into shallow bowls. Top with shrimp and sauce. Sprinkle with chopped scallions.